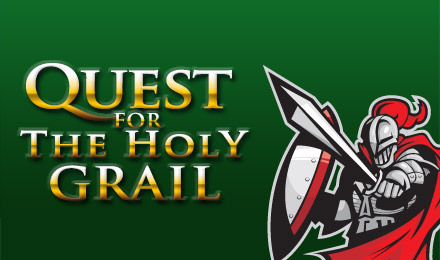 Adventure through the Quest for the Grail Slots online game at Vegas Spins! This medieval themed 5 reel slot is bustling with dragons, Wild swords, scatters, Prize Pick & Holy Grail Bonuses, FREE spins & multiple wins! Join the Quest for the Grail Slots online game at Vegas Spins, and prepare for 5 reels of medieval themed, entertaining action adventure past roaring dragons, fair maiden princesses and shields. Collect the Wild Sword Excalibur to double your prizes and scatters to trigger the Prize Pick & Holy Grail Bonuses. Score holy FREE spins and maximize your wins by 100 on your quest for riches!